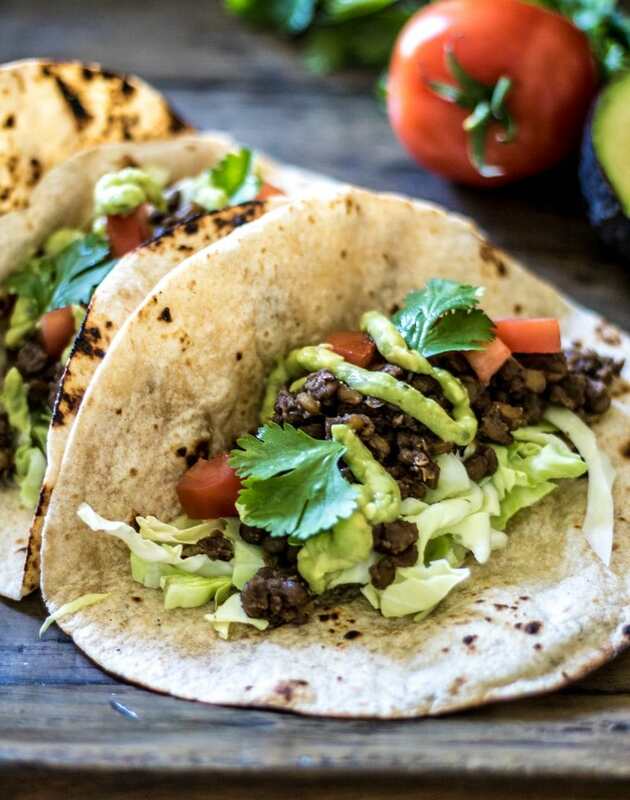 Easy Lentil Tacos with Avocado Cream are a delicious meatless version of tacos. Lentils are simmered with taco seasoning and finished with avocado lime cream and crunchy cabbage for a perfect balance in flavors and texture. 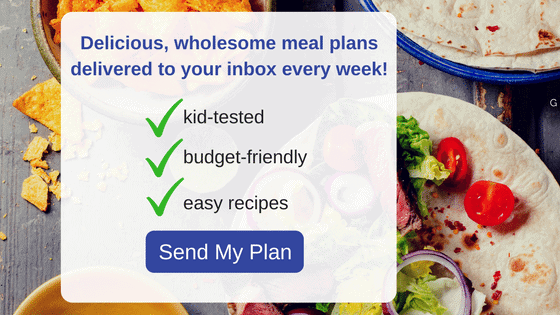 One request I often get is for more meatless meals that satisfy both vegetarians and meat eaters. Lentil Tacos are just the answer you are looking for. Lentils are a sort of magical thing when it comes to meatless meals. They have a similar texture to ground meat, are easy to find, easy to cook, and take on any flavor you are going for–therefore they are really easy to get picky family members to eat. I often use lentils to make sloppy joes and they are always a hit with my family, including my meat-eating husband. Not to mention that lentils are inexpensive. But really who cares if you save money if no one will eat your meal, right? You don’t need to worry with these slightly spicy Lentil Tacos. They are AH-AMAZING!!! 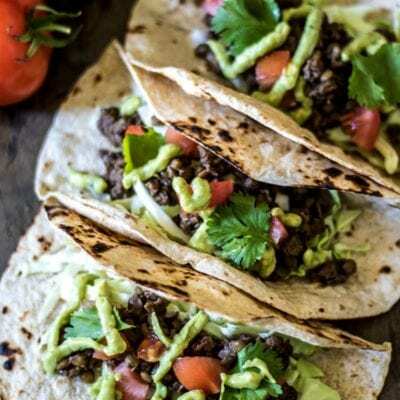 The lentils themselves taste just like traditional ground taco meat and when paired with a fresh lime avocado cream, these meatless tacos are sure to be devoured. Bring water, tomato sauce, taco seasoning and lentils to a boil. Turn heat to medium-low, cover pan, and simmer for 15-20 minutes, or until lentils are tender and liquid is absorbed. Blend or mash the avocado with lime juice and salt. Finely shred cabbage. Sprinkle with lime juice. Chop tomatoes and onions if using. Warm tortillas (corn or flour). Place generous scoop of lentils onto each tortilla. Top with shredded cabbage, diced tomatoes, chopped cilantro and the avocado cream. Lentils are the base for hearty vegetarian tacos topped with an avocado cream. Bring water, tomato sauce, taco seasoning and lentils to a boil. Turn heat to medium-low, cover pan, and simmer for 15-20 minutes, or until lentils are tender and liquid is absorbed. While lentils are cooking, prepare the avocado sauce, by mashing the avocado with the juice of 1 1/2 limes and salt. Use the remaining lime juice to drizzle the cabbage with. Also, char the tortillas. I put them directly over my gas burners (over medium-heat) for 1 minute per side, but you can also heat them in dry hot skillet the same way. To assemble, place a layer of cabbage on tortilla, top with lentil mixture, diced tomatoes, cilantro and a drizzle or dollop of the avocado cream. Good idea to replace the meat by lentils, must taste great! Thanks Patty—these really do taste great. We are taco lovers….and these look awesome. Avocados are so delicious and nutritious. Perfect for a fun family meal. I do love these tortillas! And you will LOVE that crema! 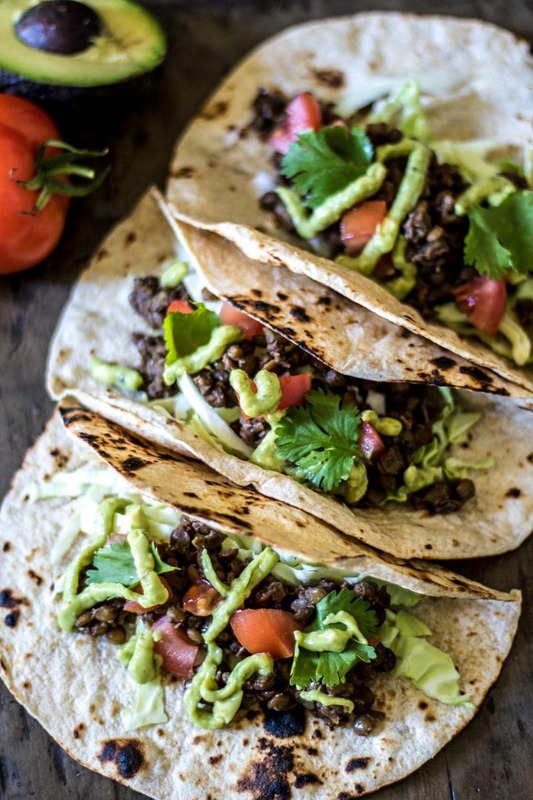 I love lentils and never thought of making tacos, I have to try this. I also love that Mission now makes organic. Tacos are a great way to use lentils for sure. They are always a family winner!